Back in my Univeristy days, Goodards pie and mash was my budget lunches meals for £3. £3 was such a bargain for a hot meal, this includes a pie, mash, and a choice of peas or beans. Located right next to Cutty Sark station your just minutes away from the family run business. The chicken and mushroom pie is the best I had in London, filled with white creamy sauce and tender soft chicken and mushrooms packed with flavour. 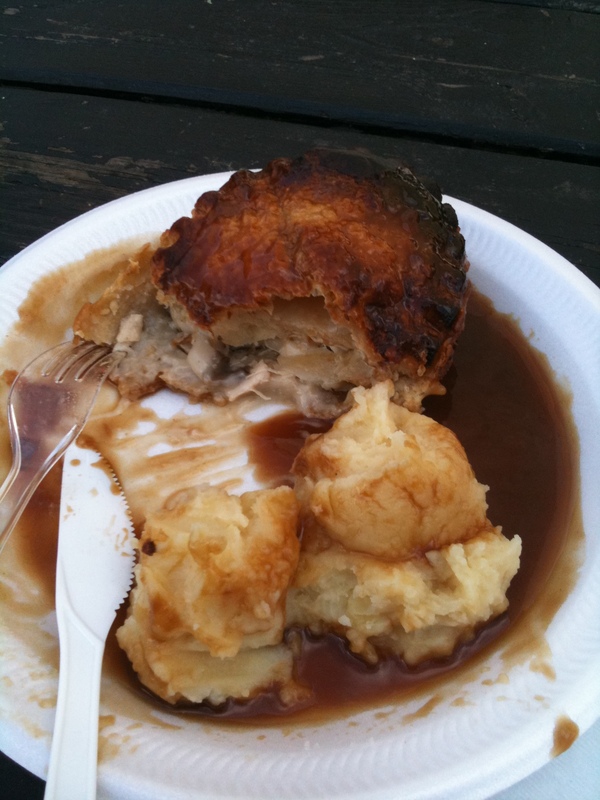 The crust was nice and flaky, but the mash was a bit of disappointed it tasted bland with no flavour. Sadly the place has closed down, but Goddards pie and mash operate every weekends in a stall just behind natwest bank. The crust has now change when I last visited a few weeks ago, it’s no longer flaky but the filling is still as great as before. Goddard’s traditional pie and mash is available in Greenwich every weekend from 9.30am. You can find them in the Fountain Court, Greenwich Church Street, next to NatWest bank. Open each weekend including most bank holidays. (9.30am until approx 5.30pm). The same great food you have all been missing – handmade and baked fresh daily.